Russell Westbrook registered his 10th straight triple-double on Monday. No other human had ever had more than seven straight triple-doubles in the NBA — Michael Jordan did that once. Westbrook now has 23 triple-doubles on the season, with an outside shot at matching his record 42 triple-doubles from 2016-17. After averaging a triple-double in each of the last two seasons, he’s actually doing it again with a twist: he’s currently at 21-11-11. I mean, he’s averaging a 20-point triple-double with room to spare. This is not normal. This is not something we should nod at and move on. This is absolutely absurd. 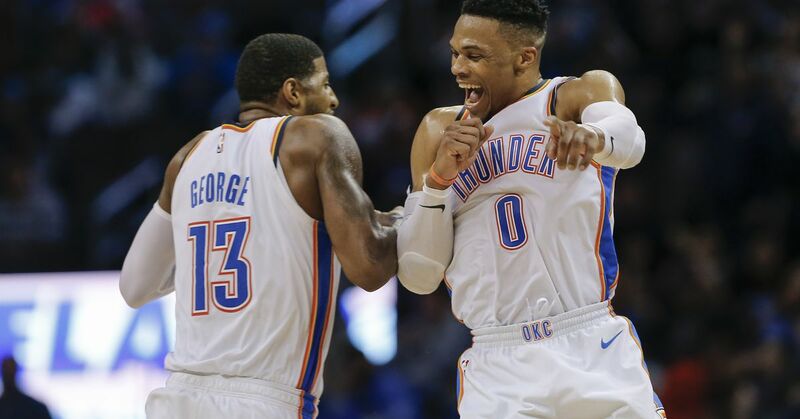 And before you start yelling about field goal percentage: during this streak, Westbrook’s True Shooting percentage is .579, some 20 points over the league average for the season. Westbrook’s scoring efficiency is quite bad for the season overall, but it’s been much better of late. Also, if you’re curious, the Thunder are 9-1 during Westbrook’s streak. They are one game out of the No. 2 seed in the West. Paul George is the No. 1 reason the Thunder look like a real threat to get the honor of being swept out of the Western Conference Finals. (PG-13 had a 47-point triple-double on Monday against the Blazers. Wow!) But ignoring or dismissing what Westbrook is doing is to deprieve youself of a bit of the little magic left in this cold world. Love Westbrook and love yourself. All times Eastern. Games on League Pass unless otherwise noted. An incredible story on Steve Kerr’s family and the Armenian community. Yes yes yes a REWINDER episode on Vince Carter’s unreal 2000 dunk contest. Alex Wong with a great feature on the art of talking to an NBA official. I wrote about Anthony Davis’ blame in his now ultra-weird situation with the Pelicans, and how the NBA’s devotion to the NBA Draft drives so many decisions with bizarre ramifications. The Sacramento Kings, who are now in the No. 8 spot in the West, finally have a positive team culture. A theory that the Lakers should trade all their chips for players that the Pelicans might like more than the Lakers’ chips. This week in egregious uncalled violations: Kevin Durant with a blatant double dribble. Bradley Beal travels about a quarter-mile without dribbling. But my favorite: DeMarcus Cousins holds down a fallen Josh Richardson while theoretically just trying to retrieve his favorite towel on the final possession. I love everything about these homage NBA Jam t-shirts. Kawhi Leonard game-winner off the glass. How can Brad Stevens spark joy among the morose Celtics? The Wolves are going to have to get creative. Be excellent to each other and yourself.